This night felt strange, Darkflight thought as she strolled through ThunderClan's territory. What remaining warmth the trees held beneath their branches from the day had all but disappeared, and a sense of foreboding filled the air. Even in this darkness, the old warrior made no sound as she padded around fallen twigs and leaves without being aware of doing so, the location of every tree, bush and stone lay firmly in her mind. The trees were turning the colors Leaffall brought as it rolled in, the thin green sheets turning yellow, gold, orange, brown and purple as they died and fell to be amongst their siblings on the forest floor. Their flaming hues greyed under the dim light of the night, with the full moon hidden by a layer of clouds blanketing all of the sky. 'A storm must be coming in,' she thought, eyes to the faint edges of the balding tree branches high above. Though the lack of wind was not lost on her. Perhaps they had just been blocked by the rest of the forest. Her midnight walk had her pass by Sunningrocks, those historically blood-splashed stones. She'd once had her clan shelter there after the fire that had destroyed much of the territory, and with RiverClan's hospitality, or rather the lack of it, they might as well have returned to the barn instead. Little shadows across the river caught her eye for a moment, a view of two young RiverClan cats with no other accompaniment. Were they coming for Sunningrocks? At this time of night? Deciding that it wasn't really her business what her rival clan's apprentices got up to, she made a move to leave. But a trace of a trace of a scent caught her undivided attention. Her hackles raised as the bitter, mangy, musty smell floated on the breeze. Something was close. Very close. Something dangerous had slipped past the border patrols and was now making its merry way towards the bare, flat stones on the river's banks. "Smile, my boy. It's sunrise." Weaelpaw trotted along the banks of the river, Fallowpaw by her side. It probably wasn't her best idea taking RiverClan's medicine cat apprentice for a walk, it wasn't even a good idea during the day, and both ways it was definitely against the rules. There were no warriors about, but in Weaselpaw's opinion it was calm enough, and they were fine. The pale ginger molly dipped her paw into the water and brought it out, splashing Fallowpaw. "Sorry," she giggled I couldn't help myself." Weaselpaw shook her paw ridding it of the small water droplets, and placed it down. "sorry if we get in trouble, this was a bad idea." Her eyes scanned over the territory, noticing a shape by Sunningrocks. She peered at it, craning her neck forward. "There's something at Sunningrocks... You want to check it out?" That was another of Weaselpaw's bad ideas. Fallowpaw's reaction to the apprentice splashing her with water was far more mundane than Weaslepaw had likely been expecting. She merely twitched where the water made contact with her fur, shaking it out after a few moments of glaring at her Clanmate in silence. "We won't get in trouble, Weaslepaw. We're gathering herbs, nothing more. Now, let's get what we came for and get back to camp." She turned and was going to start walking the other way, when her ears flickered back to catch whatever it was that Weaslepaw was talking about now. Sunningrocks...? This can't be good. Despite every nerve in her body telling her not to, she turned around to try and catch a glimpse of the 'something' Weaslepaw had seen. Her carefully trained eyes ran back and forth over the territory, an occasional squint interrupting her otherwise complacent stare. She didn't think she saw anything, but something was definitely... Off. Not with anything she could see, but the small medicine cat apprentice felt an aching in her chest, all her instincts buzzing, telling her to go, turn around, get back to camp. "No, I-I don't think that's a good idea... W-We need to hurry up and get back, anyway..." Her small paws shifted uncomfortably as she glanced back towards Sunningrocks, her tail flickering back and forth nervously. Darkflight's golden eyes traced the movements of something just edging the clearing. Her hackles stood on-end. It passed through a ray of moonlight, reflecting brightly on the animal's orange and white fur. She knew exactly what it was. Her thoughts connected quickly. Every step the pair were making brought them closer and closer to those waiting jaws. Barely thinking about what she was doing, she launched into action, stumbling around Sunningrocks and nearly slipping on their slick surface. She was technically trespassing right now, but there were more pressing matters at the moment. "Get back to the other side, now!" It was a moment too late though, as the predator had already spotted its next meal. It stalked forward, watching the young cats with hunger in its eyes. Suddenly it sprang, revealing itself to be a famished fox. It was skinny and wiry, but that only made it more dangerous. It lunged for the two warm-colored she-cats with its thin jaws wide open. "But what if it's an intruder? I have to protect the clan, and you." mewed Weaselpaw edging closer to where she'd seen the shape. Her pawsteps were light, she didn't want to alert the creature to their presence. Her ears swivelled forward, catching another cats voice. A lo growl rose up in her throat "Why-" A flash of orange in he dim light caught her eye, and her attention shifted. "Did you see-"
Her sentence was cut off as a skinny fox bursyed through the bushes, it is jaws snapping as it lunged at the apprentices. Weaselpaw let out a terrified squeal, as she leapt back. The creature's jaws snapped shut, where she'd been standing before. "Get behind me Fallowpaw! she hissed, jumping forward in an attempt to land a blow on he fox. "I'll try and hold it off, go back to camp and warn the others... We can't let it get any further into the territory!" Fallowpaw's eyes flashed back and forth from the fox, whose sudden appearance had startled her so badly that she'd leaped back and stumbled onto the ground in a heap, to Weaslepaw, who was trying to take on the fox despite it being double her size. Immediately images of Jaystar and the red-furred creature sparring filled her mind, of the damage it had done to her before Jaystar had a chance to pry her from its jaws. Her wounds from the last encounter, which had not completely healed, pulled on her skin as she struggled to get up, frozen in place as she looked into the fox's sharp eyes. She couldn't bring herself to move when Weaslepaw spoke to her, her whole body shaking, whiskers trembling. She wanted to speak, to yell out for Jaystar to help her once again, but her words were caught in her throat as she fumbled helplessly over her words. Seeing the mangy predator lunge for the two young cats sent her legs into overdrive. Faster than even some of her four-legged Clanmates, Darkflight launched herself towards the fox, jaws wide as she bit into its flank with animalistic ferocity. An awful, acidic taste spread into her mouth. She wanted to let go, but she couldn't. The faint scent of herbs floated towards her from one of the young RiverClan cats. One warrior, a rival apprentice, and a medicine cat couldn't fight off a fox alone. Holding the fox down for the time being, the old warrior ripped a chunk of fur from the fox's neck. Dark blood sparkled in the faint moonlight as a thin rivulet wove its way towards the river's edge. "I'll hold it off! Just go!" She half-snarled as the fox gave her a few sharp kicks into her stomach, nearly frothing at the mouth in anger. It happened in a flash. One minute the fox was looming over Weaselpaw and Fallowpaw, and the next it was focused on tearing some new cat in half. Weaselpaw's blood ran cold, the fox was going to kill the cat that had saved them. She stood still as they tussled, captivated with fear for this new cat. It was fine when it was her fighting, but now it was different. It was far more scary. When the warrior called out, Weaselpaw felt something inside her head switch on, and she found herself able to form a coherent sentence. "but you'll die!" The ginger apprentice just couldn't let it happen, she couldn't leave the warrior to fight on her own, when she could help her. Fallowpaw's gaze only shifted when the fox's attention was grasped by another cat, but she was still unable to move, shell-shocked. Her plagued memories were at fault, the thoughts of the damage the fox was able to do to Jaystar, a strong, young, and healthy cat. The dark cat that had saved Wealsepaw and herself was in no condition to fight a fox. She was much older, with the scars to prove it. The fact that she was missing a leg topped the cake, and with the help of only a measly apprentice, there was no way that all of them could come out of this alive. Fallowpaw shook her head strenuously, trying to clear the pessimistic thoughts from her head. She couldn't forget her training... Especially in a time like this. Her mind kicked into gear, her body soon following suit. This cat was risking her life to save both of them, and Fallowpaw wasn't about to let that be in vain. She couldn't risk Weaslepaw's life, either. She had to get out of here, had to get help. This ThunderClan warrior, no matter how virtuous she may be, would not last long fighting the large predator. And as much as she hated to see it herself, if this didn't end well for the older she-cat, Weaslepaw didn't need to see it. Things like that are damaging, a fact that Fallowpaw knew all too well. "Go get help, Weaslepaw. Run to camp, and don't come back without a warrior. Got it?" Try as she may, Fallowpaw could not mask the worry plaguing her tone. For now, she just prayed to StarClan that everything would be okay. She held the canine fast, but there was no way she’d win this fight alone, nor with the help of two young apprentices. Darkflight felt one of her paws slip off the fox’s shoulder, and suddenly they were wrestling, the line between her and the paler-furred creature blurred as blood soon coated both their pelts with a noxious sheen of deep red. Words were lost in the cacophony of growls and snarls. She couldn’t see anymore, possibly from the blood dripping into her eyes, or the adrenaline of the moment. They ripped and tore at each other with the ferocity of two wild dogs. She was finally able to push the fight against Sunningrocks, those stones already so accustomed to blood being splattered across their smooth faces it was a wonder they weren’t rust-stained already, momentarily getting her ragged opponent stuck between the unmoving boulders. The old warrior stepped back to draw in shuddering breaths. Her paws felt cold, and not just from the chill of the Leaffall air. Her ears and tail felt slightly numb, she was more sluggish, and upon turning her head slightly to face young Fallowpaw a wave of vertigo threatened to overtake the ThunderClan she-cat. “Go home. I can,” She took a gasping intake of breath as her train of thought began to veer off its tracks. She was losing too much blood, though her thick fur kept much of that secret. As she spoke though, the inside of her mouth was revealed to be deathly pale. “, I can run for reinforcements, get out of here!” Then, the fox got itself loose and lunged for her again. She tried to dodge but was a moment too late as one of its grime-covered paws connected to the side of her face. She found herself pinned to the ground, feeling the pebbles digging into her lacerated back. There wouldn’t be time to run, she knew that full well. Darkflight snarled and viciously slashed her over-extended claws over the fox’s eyes, causing it to yelp and rear its head back at the pain. This was her chance! She stretched her forepaws around the neck of the ginger canine, pulling it down until she could grab a hold of its throat. She sunk her fangs into the pulsing channels in its neck, feeling the hot blood run over her and, regrettably, into her mouth. Her opponent wasn’t finished yet though, as its strong paws battered and beat her stomach as it tried to escape her grasp. A short series of sharp CRACKs resounded from her chest and she let go in shock and agony. Though the fox had escaped, it was far too late, as its once-sharp, hungry eyes dulled, rolled back into its head, then met the ground as it crumpled. Its chest rose and fell weakly once, twice, then no more. The old she-cat did not get up. Instead she lay beside her fallen enemy, struggling to breathe, trying to keep her eyes from closing. It took a few moments before she could will herself back onto her paws, three legs shaking and almost completely numb. A rough cough shook her body and red splattered the already russet ground before her. ‘Come on, I have to get back home. I can’t die here. There’s still so much I need to do!’ Heaving herself forward, she moved to the forest’s edge to return to ThunderClan camp, but the reality of her wounds reminded her she would not go far. Emotion welled up in her chest as she was forced to sit so she could breathe again, without her broken ribs stabbing through her lungs any more than they already had. Blizzardshine, Dustcloud, her oldest, dearest friends through thick and thin, she hated to leave them without saying goodbye. They’d been with her longer than she could remember, rarely did she remind herself that she was still twice their age. And Leopardstar, the tom she wished she’d protected more, but of course that was the curse that came with hindsight. It was her fault that her own son betrayed them, became unstable and set the forest ablaze with his crimes, both literally and figuratively. ‘I should’ve been more maternal to you.’ Of course, acting as a mother hadn’t helped her own children much, as her mind reminded her with a sharp jolt to her faintly beating heart. 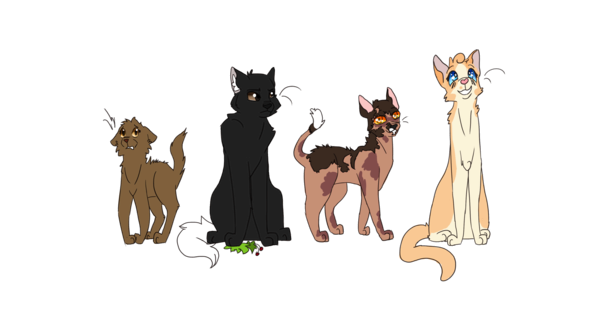 Her beloved sons, Rainwhisper, Shrewheart, Silentsong, Bramblefrost, Lionpaw, Peatpaw and Mossykit, and her daughters, Plumblossom, Pinepaw, Bristlepaw, and Fernkit. She kept her sparse memories with them close to her heart. Bramblefrost was never who she thought he was, however, not the most responsible or caring of her sons. Lionspark and Specklefang deserved better than what he turned out to be, she should’ve kept a closer eye on him. She should have done a lot more. Be a better leader, mother, warrior, mentor, a better anything. She should’ve protected Specklefang from herself, found out the truth behind everything that had happened. Been a better grandmother. Been an influence in her kin’s lives, in the lives of her countless grandchildren who milled about camp. A faint memory of her leadership ceremony calmed her despite these regrets. She would see all of her former Clanmates again. She’d see her mother Specklefur, her father Foxfang, her brother Beanfoot, her mentor Oliveheart, her deputy Frozenflame, Blacktwig, Specklefang, Lionspark, Gentlenose, all of them! She’d see them again. And her long-time mate, Jaggedfeather… she’d get to see him again too. Leaning against a flame-leafed oak, she felt her heartbeat slow, the pain of her wounds began to fade, and the little pinpricks of sun in her dandelion eyes slowly became overcast. A strange feeling, like being a piece of prey having its pelt peeled from its body, was the first to come to her. Darkflight opened her eyes and found herself beside her own limp form, beaten almost beyond recognition. Did she die? There was a wordless mrr just above her. The large frame of her mother was impossible to not recognize, beside her fire-colored father and painfully familiar and dear brother. Jaggedfeather, with silver and white tabby fur as marrless as in the days they were both warriors, appeared almost on the verge of tears. She looked at her own pelt, seeing how it now reflected the sky high above. Her father’s voice drifted to her as she absorbed the reality of what had just happened. “I told you not to come back, but I’m surprised it took you this long to disobey me.” She looked up at him in surprise, only to see him with both a look of pain and relief on his usually harsh face.